With its dependable water source, abundant fish and game, and natural beauty, the region of Central Texas around the Colorado River and present Inks Lake has been an inviting location for centuries, attracting Native American and German and Anglo settlers. In 1937 while running as a candidate for the surrounding Congressional district, Lyndon Baines Johnson promised voters that he would create a “Tennessee Valley Authority” type of transformation for the Colorado River, including dams for flood control and electricity, bridges and highways, and recreational facilities along the river. Johnson’s victory soon brought into being the Lower Colorado River Authority (LCRA) and with it the benefits of rural electrification for residents of the Texas Hill Country. 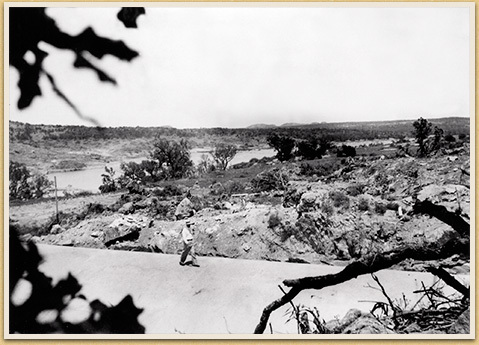 Shortly after Inks Lake was created by a new Colorado River dam, courtesy of the LCRA in 1938, Johnson sought CCC involvement to further enhance the river’s comprehensive development. Having completed work at Longhorn Cavern State Park, CCC enrollees in Company 854 moved to Inks Lake and focused on constructing and supplying amenities, including the park road and recreational facilities along the lake's left bank. The State Parks Board, National Park Service, and the CCC envisioned even grander plans for Inks Lake on both shores, but the threat of World War II curtailed further projects. Interior Park Roads and associated Stone Culverts (Park Road 4 completed by the State Highway Department in 1942), and Boat House and Dock. Fireplaces, Garage and Compound, Beach Area, Concession Building, and Custodian’s Dwelling were designed but not built.